Ananka's Diary: Happy Valentine's Day & Chinese New Year! We're celebrating Chinese New Year, even though I am not Chinese, but Happy Year of the Tiger and Valentines Day!! Happy Valentine's Day and Chinese New Year to you too! This is our first year celebrating Chinese New Year because this year we are pursuing adoption from China, so it makes us feel closer to my soon-to-be-sister! Happy year of the Tiger, everyone!!! HAHHAAA! THIS. IS. MY. YEAR. Above is the emoticon depiction of Brundibar, the German villain in a play I saw at my school. It was made in the concentration camps, and we met an actual survivor from the camp, and an original cast member of the play! I think I was the only one who enjoyed it... Except for maybe 2 teachers out of the 5 there.. I really liked it! You should so search it up! ANDDDD... A BOOK RECOMMENDATION! You all should look into the Uglies series by Scott Westerfeld. Very action packed and full of unexpected sequences. I f you like the Kiki Strike Series, you will love these! I'm just sayin here... No advertising! lol! Anna: I read the uglies series, and I liked it, my favorite was Specials, by far! I just didn't really understand Extra's and got bored with it, so I stopped reading it. I have a nice book review too. It's called the Amanda Project. The first book just came out, and it rocks! It's about this girl, Amanda, who goes missing, with clues regarding her disappearence. Now, these three kids have to find out what happened to her. She went missing on the Ides of March, and left her mark by spray painting every inch of the Principle's car. Worst part is, with every clue these guys find, Amanda just because even more strange, mysterious, and diabolical. Kinda sound like Kiki Strike?? It's a REALLY great book, but not even CLOSE to Kiki Strike, don't worry. By the way, this may be your year, Anna, but I still won. Yay! I could care less about Valentine's Day, but thanks Kirsten for metioning Chinese New Year! I'm half Chinese, so I got my lucky money envelope yesterday (called lai-see), and I'm getting my presents this weekend! My parents were behind on their present shopping because of the crazy snow we got where I live! Happy Chinese New Year to you to! Oh yeah, and Valentine's Day. We made Chinese food. It was yummy. Cassie: Yay! Have fun with your new sister! HAPPY BIRTHDAY KIRSTEN! HOPE YOUR BIRTHDAY IS SPECKLED WITH ENTRANCES OF THE SHADOW CITY!! It was not just my golden b-day, it was my platnum b-day! I was 12 on the 12th,golden b-day. in the year of the tiger, the year I was born in, so platnum!!!!! this hole little post was all about me, sorry this is selfish! Kirsten- Did you not tell us it was your birthday? You should at least put up a post so we could give you our undying appreciation and birthday wishes there! I will send you a birthday present! just contact me with an address for I am too lazy to look it up! And thanks for the book reviews Alfonzo and Anna. I will TOTALLY try them. Seems like my kinda book! And is anyone else working on a Kiki Strike t-shirt? I know I am! 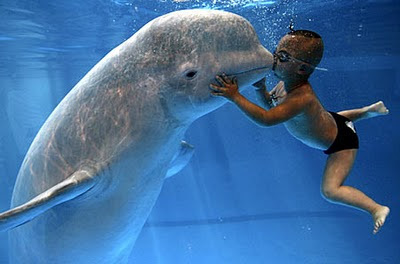 First, it's a beluga whale, one of the sweetest creatures on earth. Second, the little boy is giving it a peck the way you might kiss a dog or a cat or a baby. They are most certainly not "making out." And I find it rather disturbing that someone would suggest that they were. It's your birthday, Kirsten? Happy Birthday then! May this next year be filled with lots of money and awesome book ideas! Yay, it's my year! I am a tiger (roar). I'm not Chinese though, I just like celebrating Chinese New Year! HAPPY NEW YEAR! Man, I love that cool spinning wheel thing on the left side of the page on the KS website. It's kinda hard to click, but it's fun!! Candy wrapper in my hair.